A few summers ago when I was just about to leave on my first week long vacation I realized that I hadn’t even thought about how I would keep my raised bed and container garden from dying while I was away. There’s nothing worse than going on vacation and spending the whole time worried about things at home. I wanted to find a solution to ease my mind so I could focus on enjoying the beach. 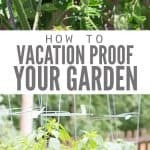 If you’re also planning a vacation this summer use these tips to make sure your garden will be happy and healthy while you’re away. 1. Carefully inspect the garden before you leave. Catch pest problems early so your garden can be in optimal health before you leave. You will be more likely to come home to a healthy garden if minor pest issues are taken care of before you go. I like to use this homemade organic pest control spray to treat pest problems. Because it’s safe and non-toxic it can be used as prevention too. Mulching helps retain water and keep weeds away. Just be sure to use vegetable garden friendly mulch. I like leaf compost or grass clippings because they are free, easy to find, and can add nutrients to your soil. 3. Have a watering plan. Water is one of the biggest concerns for your garden while you’re away. Soak your garden for about 20 minutes each evening for 2-3 days before you leave. If you have an in-ground garden or raised beds this will be enough to get your plants through about a week of dry weather. If you’re going to be gone longer, you have containers as part of your garden, or you live in a particularly dry and arid location you will want to consider an irrigation system. You can invest in a timed sprinkler system which could be helpful beyond vacation. But that means leaving the water spigot on and risking a leak. Fortunately there are inexpensive (even free) ways to create irrigation in your garden or containers. This self watering system is best for container plants. It’s simple and you can make it using any cotton fabric you have lying around. I’ve used old t-shirts, which work just fine, but if you want something that’s a little prettier you can use craft fabric like I did. Cut three strips of fabric. Braid them together and tie a knot in both ends. 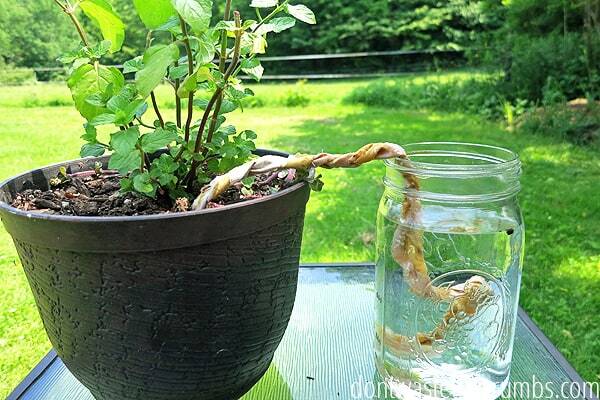 Stick one end of the braid into the soil at the base of the plant and the other end into the mason jar of water. Make sure the braid is just long enough to reach from the base of your plant to the bottom of the mason jar (or coil the extra in the bottom of the jar). 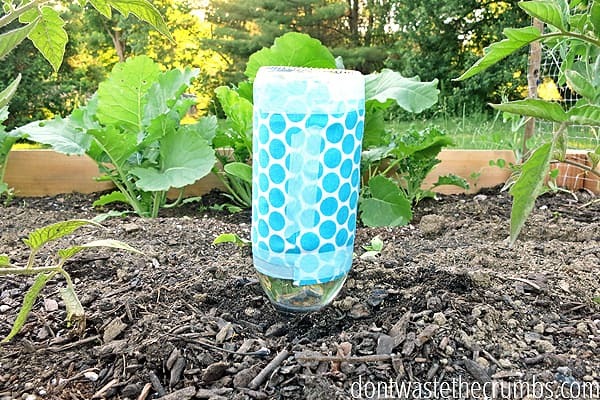 This waterer works by wicking the water from the mason jar up the braided fabric and into the dry soil. If the braid is in hot direct sunlight it will dry out before the water gets to the plant, therefore, it’s best to put your containers in a partly sunny location while you’re away so they get enough sun but not too much. This will also help them stay moist so they won’t need as much water. This one is great for in-ground or raised bed gardens but can be used for containers too. Cut the bottom of the bottle off. 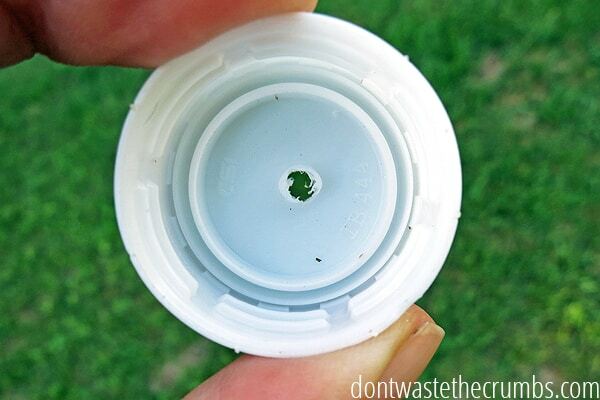 Then drill a hole in the cap of the bottle and screw the cap back on. 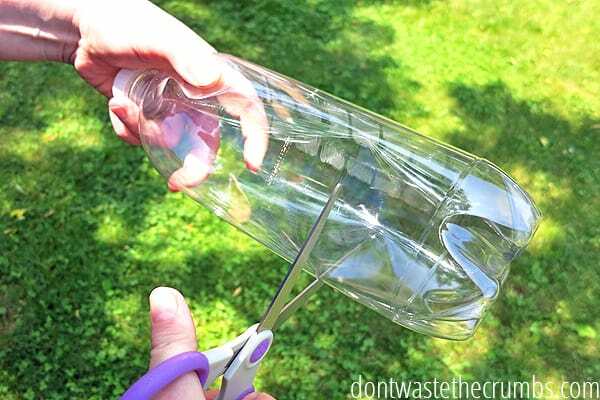 Bury the neck of the bottle in the ground close to your plants and fill the bottle with water. The water will slowly drip out over the course of a few days or a week depending on how big your bottle is. 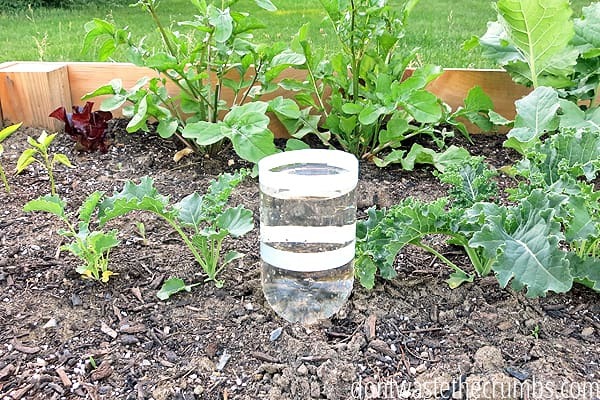 You may want to cover the top of the bottle waterer to avoid evaporation or mosquitoes. I’ve used plastic wrap or the end that I cut off, upside down and weighted with rocks. These waterers are great for any garden. Since the bottle is glass and not plastic only as much water will come out as air goes in. That means if the ground is saturated with water little if any water will come out of the bottle. It’s the quickest and easiest way to make sure your plants will have enough water. Fill the bottle with water and stick the neck in the ground near the base of each plant or between plants. I wanted to make the bottle a little more attractive (and less like there was a party in my garden!) so I wrapped the bottle with craft fabric and washi tape. Another option for your container plants is to move them to a shadier spot. A little less sun for a week won’t hurt them and will keep them from drying out too much. You can move them to a covered porch or put up a patio umbrella. You could even set up an umbrella or canopy tent over your in-ground garden too! 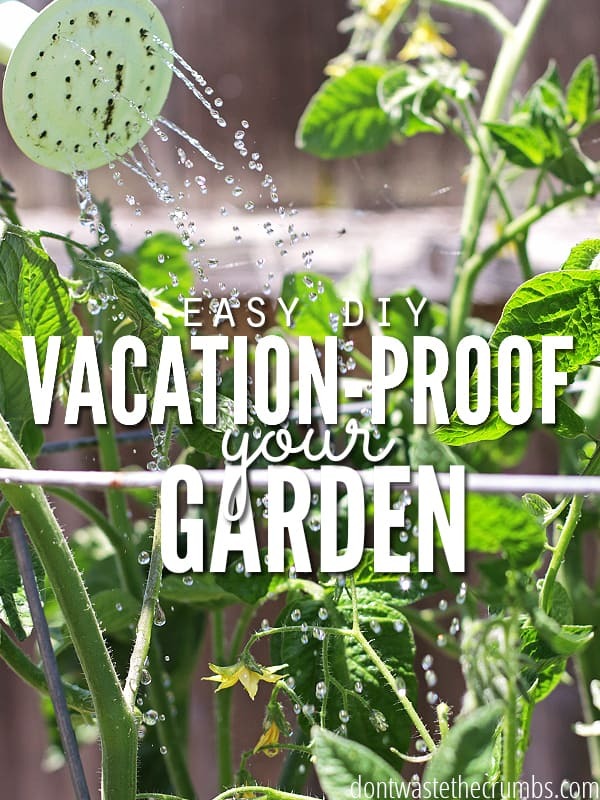 How do you make sure your garden will be healthy while away on vacation? This post is a guest post from Mindy from Purposefully Simple. My favorite method is a good neighbor! We keep an eye on their place while they are gone. In exchange, they watch ours. They pick produce that needs harvested (keeping it, of course! ), and water it as needed. I leave the hose hooked up to the irrigation lines for my convenience and theirs. It’s so wonderful to have neighbors that can help you out. That’s definitely the best way to have a relaxing vacation! I froze bottles of water and drilled holes in the bottoms. This way it took more time for the water to melt and therefore did not drain out as fast as it otherwise did. If you want to reuse the bottle now that they have holes you can stand them up in a container bucket etc and freeze in chest freezer if you have room. Great tip Beverly – thanks for sharing! I plan on trying a new method this year, planting directly into cheap, reusable shopping bags, and setting them into a plastic wading pool…you simply fill the wading pool with a few inches of water, and your plants should be all set. Interesting idea! Please do let us know how this turns out! do you need to cut out the plastic bottle? Living in Colorado, our gardens dry out very quickly, and we have to plan for watering far in advance, at the time of planting. I’ve frequently used the bottle method, but in a different way. You can use anything from small pint-size bottles for small containers or pots, to larger soda bottles for larger containers, and I will be using several 2-liter soda bottles or even gallon-size water jugs for this year’s raised beds. You need a heavy sewing needle, small awl, or thin ice pick. The larger the hole, the faster the water will run out, but also, you stand less chance of it getting clogged up with dirt. Poke many small holes around the bottle, below the neck. Bury the bottle *right-side-up* to the neck at the time you fill your pot or container with potting soil. If transplanting seedlings or small plants, work them in around the bottle. For raised beds, evenly space several larger bottles or jugs, again, *right-side-up* throughout the bed as you fill it with your desired garden soil. Its okay if they aren’t buried all the way up to the neck: this may actually help you find the bottles as your garden grows and fills with beautiful thick plants. Keeping the lid on eliminates evaporation and mosquitoes. Water the containers and garden beds as usual, but also fill up the bottles at the same time. Then there’s less need to come back tomorrow (or even the same day, here in Colorado) to water again. This also encourages the plants to root deep to go after all that yummy water lower down in the soil. As a novice gardener these watering ideas are wonderful – thank u so much! So timely as we’re going on vacation soon AND I just saw aphids on my tomato plants. Gonna check out that pest spray, thanks! It might not help with mosquitoes, but putting small plants in a couple inches of water, say in a storage tub, can hold them over for an few days to a week. Thanks for the idea Jenne!